Background: General supportive and preventive measures in the intensive care management of traumatic brain injury (TBI) aim to prevent or limit secondary brain injury and optimize recovery. The aim of this survey was to assess and quantify variation in perceptions on intensive care unit (ICU) management of patients with TBI in European neurotrauma centers. 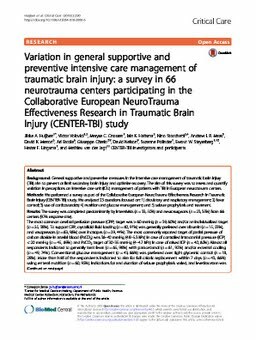 Methods: We performed a survey as part of the Collaborative European NeuroTrauma Effectiveness Research in Traumatic Brain Injury (CENTER-TBI) study. We analyzed 23 questions focused on: 1) circulatory and respiratory management; 2) fever control; 3) use of corticosteroids; 4) nutrition and glucose management; and 5) seizure prophylaxis and treatment. Results: The survey was completed predominantly by intensivists (n = 33, 50%) and neurosurgeons (n = 23, 35%) from 66 centers (97% response rate). The most common cerebral perfusion pressure (CPP) target was > 60 mmHg (n = 39, 60%) and/or an individualized target (n = 25, 38%). To support CPP, crystalloid fluid loading (n = 60, 91%) was generally preferred over albumin (n = 15, 23%), and vasopressors (n = 63, 96%) over inotropes (n = 29, 44%). The most commonly reported target of partial pressure of carbon dioxide in arterial blood (PaCO2) was 36-40 mmHg (4.8-5.3 kPa) in case of controlled intracranial pressure (ICP) < 20 mmHg (n = 45, 69%) and PaCO2 target of 30-35 mmHg (4-4.7 kPa) in case of raised ICP (n = 40, 62%). Almost all respondents indicated to generally treat fever (n = 65, 98%) with paracetamol (n = 61, 92%) and/or external cooling (n = 49, 74%). Conventional glucose management (n = 43, 66%) was preferred over tight glycemic control (n = 18, 28%). More than half of the respondents indicated to aim for full caloric replacement within 7 days (n = 43, 66%) using enteral nutrition (n = 60, 92%). Indications for and duration of seizure prophylaxis varied, and levetiracetam was mostly reported as the agent of choice for both seizure prophylaxis (n = 32, 49%) and treatment (n = 40, 61%). Conclusions: Practice preferences vary substantially regarding general supportive and preventive measures in TBI patients at ICUs of European neurotrauma centers. These results provide an opportunity for future comparative effectiveness research, since a more evidence-based uniformity in good practices in general ICU management could have a major impact on TBI outcome.